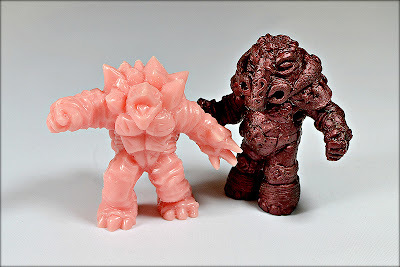 Hell Turtle and Elephunt: These are the line's first two boss figures, meaning they're bigger, bulkier and all-around more formidable than the other characters. Hell Turtle was sculpted by Jimmy and has amazing detail, particularly the awesome-looking back of the shell. It would have been easy to disappoint after this guy, but Eric's Elephunt warrior does not; he sports an amazing sculpt as well, and even has a removable helmet! It's safe to say these are going to be two of my favorite figures of the year. 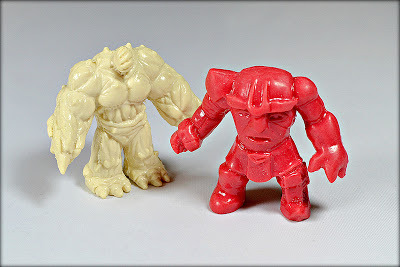 The Brute and Blemmyae Warrior: These guys were sold as one of UoV's first sets of two. As you might expect, the Brute is a big shambling mound of terror. I think those are giant sharp teeth he's got in his abdomen, and he pretty much has no face, which is kinda creepy (I don't know why, but things without faces just are). 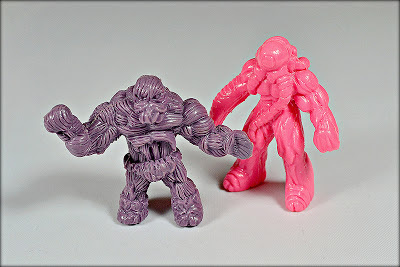 The Blemmyae Warrior is one of the more straightforward sculpts of the line so far, but also one of my favorites. You can pair him with the series 3 Monster in My Pocket Blemmyae figure and get double the Blemmyae fun. Cedargief and Eyeklops: These two also came as a set. Don't be fooled by the pleasant Eastery colors of their incarnations pictured above--they mean business. Just look at how badass Cedargief is with his highly-detailed wood-monster body and ready-to-rumble pose, and you can't go wrong with a figure that combines a cyclops with tentacles, can you? Great stuff. Big Arm and Deadface: Finally, we've got the third set of two released last year. And I saved the creepiest for last. From the first second I saw it, Eric's aptly-named Big Arm has weirded me the hell out with its gigantic, veiny, bulging right arm paired with a pygmy body. Yikes. I still don't know exactly what to make of it, and I kind of like that. Deadface is not quite as strange. You know, just a deranged ghoulish psychopath with a spike for a hand. BONUS! Baby Violence-mongers: While we're taking stock of this line, I thought it would also be a good time to show off the interplay between UoV and another Nilla/Rommel collaboration, Gorewad Monsters. As you can see, some of the UoV characters have mini Gorewad counterparts. Too cool. With plans to release a new UoV figure every month this year, I'm really looking forward to seeing everything Jimmy and Eric have in store for us. Keep an eye on their respective blogs linked above to stay in the loop on future releases!